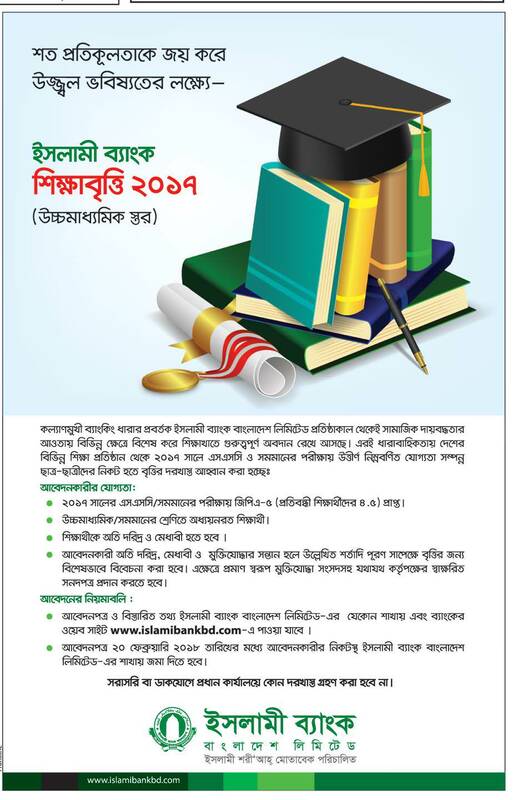 Islami Bank Scholarship Notice For SSC Batch 2017 has been published at the newspaper Prothom-Alo. Today 30th Jan 2018, Sonali Bank authority has been published their Islami Bank Scholarship Notice For SSC Batch 2017 notice at the Prothom Alo newspaper. Islami bank is the most popular and one of the leading government Banks of Bangladesh. If you want to apply in the Islami Bank Scholarship Notice For SSC Batch 2017, you should bear in mind must follow some instruction. The instruction is given below at the circular. There are many poor and helpless students in Bangladesh. As Bangladesh is a under developing country, it has most people helpless and poor. If you are a poor brilliant/ freedom fighter son or physically disable and you need to be a student of HSC, Alim and Equivalent level then you can apply for Islami Bank Scholarship Notice For SSC Batch 2017 otherwise you can’t apply for Islami Bank Scholarship Notice For SSC Batch 2017. All general poor students need minimum GPA 5.00 & disable students need to have minimum 4.50GPA in the SSC 2017 examination. See circular for more information. Scholarship Amount For Students 10,000 Ten Thousand BDT once. Application Starts On 31st Jan 2018. Application Deadline 20th Feb 2018. In this Scholarship, only poor and helpless students can apply. The rich and helpful student can’t apply for this scholarship. Here you can all terms and conditions for applying for Islami Bank scholarship. You can follow given below link so that you can easily apply for this scholarship. To get More update visit here Bdresultpage. If you want to get any types of job circular Like as Government and the Non-Government job you should need to visit our website regularly. If you want to get Facebook notification you must be needed to like and follow our social media. Our Facebook Fan page Link is www.facebook.com/Bdresultpage. To get regular such scholarship news and results of it and government non-government jobs circular, news, results stay with our page and share our post to your timeline. You can also comment on our Facebook page at www.facebook.com/Bdresultpage or message to our Facebook page directly to contact us and to get more information about Islami Bank Scholarship Notice For SSC Batch 2017. Thanks for being with us.